Oops. Water floods Seven News studio. 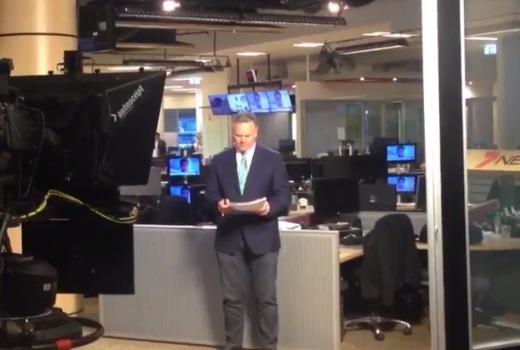 Seven News presenter Peter Mitchell was forced to present his Melbourne bulletin from the newsroom last night after a boiler exploded and flooded the studio. Despite the disaster hitting on Grand Final Eve, the bulletin still got to air thanks to some quick thinking. Thanks to everyone for their best wishes tonight. Our #7NewsMelb team really pulled it together at very short notice to get us to air! If they’re insured with NRMA don’t bother claiming. Our hot water systems have exploded three times in the past 20 years and flooded our home and the NRMA knocked us back each time. Not Seven’s Day. Sydney blonde #3 told us (Friday night) “don’t forget to put your clocks ahead by one hour tonight”. Blonde #1 failed to correct her. Then we see Nine Sydney send a crew all the way to Goulburn to do a stand-up on something that happened there two days ago, in front of a wall, in the dark, which could have been anywhere, interviewing no one, while the real event happened at Wollongong, down the street from WIN Hq, Nine’s affiliate. Why didn’t Nine just take WIN’s report? Up-to-the-minute from the real scene of the action an hour or two earlier. Mitch handled it very well. Didn’t miss a beat. Lucky for 7 Tim and Jane were out of the studio might have been a bit crammed fitting them all in the newsroom.